Although not considered attractive, chain link fences are very durable and are often found on older properties. This is a guide about dressing up a chain link fence. A chain link fence is durable and long lasting. It is a great choice for defining property boundaries and keeping your children and pets safe. Unfortunately, the dull, utilitarian look of the metal can also look stark and unattractive. Here are some ideas for adding some charm to your chain link fence that will help it blend more seamlessly into your landscape. Vines and climbers: The very structure of chain link makes it the ideal, ready-made trellis for vines and other climbing plants that twine or cling to supports. 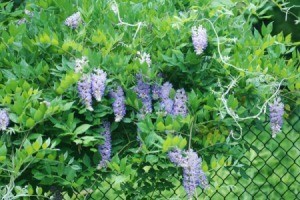 Perennial vines such as clematis and honeysuckle produce beautiful flowers, or you can go with vines grown primarily for their foliage such as Dutchman's pipe (Aristolochia macrophylla) or English Ivy (Hedera helix). Fruit trees: For an edible alternative, many varieties of standard, semi-dwarf, and dwarf fruit trees can be espaliered (trained to grow on a flat plane) and grown on chain link fences. Examples include apple, apricot, peach, nectarine, fig, persimmon, and pomegranate trees. The downside is that an espaliered fruit tree requires pruning at least two or three times a year to maintain its shape. The upside is fresh, edible fruits right from the fence. Fruit trees require full sun and good soil drainage, so your fence needs to be positioned appropriately. Skirt the bottom of your fence with clump-forming perennials, such as daylilies and irises, to help control weeds and reduce mowing and trimming tasks. Before you plant a perennial vine or espalier fruit tree near your chain link fence, it's a good idea to experiment with some annual vines first. You may even find that you prefer the flexibility of being able to play with different colors and amounts of coverage each year, rather than being stuck with plants that are permanent. The following are examples of vines that have vigorous growing habits and often reseed themselves. Research how these plants respond to your particular growing zone, as a few may become invasive under the right conditions. Over time, chain link fences tend to rust and fade. One way to improve their appearance is to paint them black or dark green. Painting your fence will make it look less industrial and help it to blend more seamlessly into the surrounding landscape. A dark color like black or green will also help showcase your plantings. The best tool for painting a chain link fence is a deep pile paint roller and a medium brush for touch-ups and painting the posts and poles. Use a rust-inhibiting, self-priming paint for good coverage with just one coat. Plan on one quart of paint per 20 feet of standard 4-foot-tall fencing and follow the directions on the can for prepping the surface before painting. I'm on a budget and I would like to know any inexpensive ideas on how to cover a chain link fence with panels of some kind. I do not want to use inserts as that would take too long. Someone told me to use shower curtains but I'm not sure. I want it to look nice as the neighbors can see it. Buy a packet of morning glory seeds. 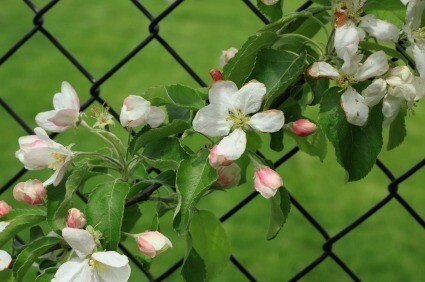 They will quickly grow and cover your fence with flowers and beautiful leaves. Leave them to go to seed in the fall and you will have even more next year. I found a pile of shutters on the side of the road and used them to provide privacy and cover our chain link fence in one spot. I just used zip ties to tie them to the fence. Another idea I had was to use old doors leaned on the fence. I just found the shutters first. Check out the dollar stores for the table runners out of bamboo, sometimes you can find them at the evrything is a dollar store. I not sure how long or high your fence is, but you have had some really good ideas, if you have a green thumb, not brown like mine. Also saw on t.v. that old vinal window blinds, cut apart, made a table top, don't know why they wouldn't work to slip through the links . look at reed or bamboo roll fencing, they are available at lowe's now. They attach right on the chain link and are inexpensive. If you are in an area that is not affected by the wind a lot. Try plastic tarps. I use them on my 6" fence using 6 X 8 tarps attached with plastic zip ties. We have a horrible chain link fence in the back (belongs to a neighbour). We bought barerrot Red Robin Hood Rose babies online, and planted them in the end of July this year. Right now, in September, they all are almost 4 feet tall bushes with beautiful flowers that have been blooming since August. They just took off so fast! We will be getting more in spring. They look amazing, grow very fast (supposed to be up to 7 feet tall), do not require much of care and tolerate sun, rain, and bad soil as well. Highly recommended. I have a 6x6 chain link dog pen. Any ideas on a way to dress it up so it looks nicer. I don't want to screen it entirely, I want the pup to see out when she's in it. I used mardi gras beads every year, its very colorful,but put them high enough for the dogs not to chew them. how about a lattice surround, looks nice, but doggy ahould still be able to see!